Many of the Spanish-speaking members of the crew took part in an unusual "banking" scheme where each week all the members of a large group would sign over all their paychecks to one guy. The recipient was selected on a rotating basis, and the way it worked, I gathered, was that for about two months or so everybody squeaked by, doing their best to make do without a check, spending little... until the day it was their turn, at whcih point they came into thousands of dollars and could spend like drunken sailors. This practice made no sense to me. It also required an extraordinary amount of trust in one's fellow cooks. I did not share my comrades' confidence that Luis, for instance, wouldn't skip town on a drunk after getting his big payday and leave the others in the lurch. I held on to my meager paycheck. I had no time to spend it anyway. I know that's it's difficult for grad students and postdocs to save money, but this sort of pooling would seem like a great way for an emergency fund of some kind. Granted, you run into the same problem -- how much do you trust your labmates with your money? Who is the treasurer? Which 5-gallon can of solvent do you drop on their feet when they skim off the top -- the acetone or the dichloromethane? 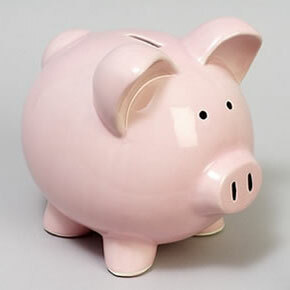 Readers, what's the best way for graduate students and postdocs to have some meager savings? New York City-based SiGNa Chemistry, which has developed and patented a green method for stabilizing reactive alkali metals in nanostructured porous oxide powders, is also expanding into new industries, such as oil and gas, batteries, and alternative energy. As a result, “we are hiring rapidly,” says its president and founder, Michael Lefenfeld (see page 43). SiGNa has been recruiting inorganic and materials chemists, as well as chemical engineers, material engineers, and ceramic engineers to add to its current staff of 65. I think reporters do a great job when they get employers to say these things on record -- we all know that it's an employer's market right now, but it's great when employers are confident enough to say it. Good morning! Between August 28 and August 29, there were 16 new positions posted on the ACS Careers website. Of these, 6 (38%) are academically connected. Columbia, MD: Shimadzu is looking for a B.S. chemist to be an elemental spectroscopist. Toledo, OH: Betco (a cleaning formulations company) wants to hire a B.S. chemist to be a product development chemist. Iselin, NJ: Know TEM/SEM? Got a B.S. in chemistry? BASF would like to hire you. Champaign, IL: Eastman Chemical Company is looking for a B.S./M.S. analytical chemist (GC, GC/MS, LC). Looks to be fermentation-related? A broader look: Monster, Careerbuilder, Indeed and USAjobs.gov show (respectively) 229, 824, 2,730 and 16 positions for the search term "chemist." 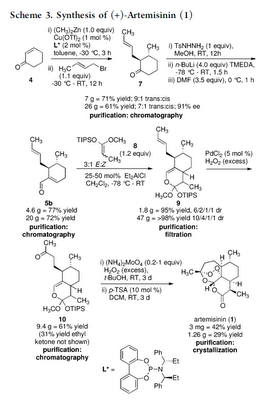 My eye was drawn to a recent synthesis of the anti-malarial compound artemisinin, published by Zhu and Cook in JACS recently. I'm not much of an expert on the molecule or the variety of routes to it, but it is novel and pretty convergent. (The main scheme from the communication is to the right.) The Cook group appears to be able to offer gram quantities of artemisinin via a relatively quick route; that's pretty impressive. Speaking as a rank novice process chemist, I feel like we need to quit asking academics about the scalability of routes; it's not their role to perform process development to manufacturing scale. But reporters want to know if total syntheses are practical (and rightly so!) and it offers professors lots of opportunity to speculate. Professor Cook made a wise choice with his "very well could be" quote; there's a lot of work to be done between the lab and the plant. Zhu, C.; Cook, S.P. 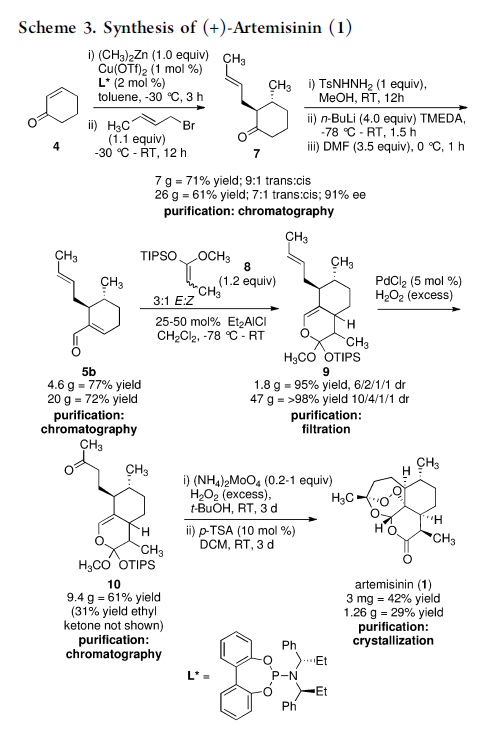 "A Concise Synthesis of (+)-Artemisinin." J. Am. Chem. Soc., 2012, 134, 13577-13579. So, when applying for faculty positions, they always ask for 1) CV, 2) cover letter, 3) research proposal, 4) statement of teaching philosophy. Now, all this is fine and to be expected. What bothers me is when they ask for 3 letters of reference - right off the bat. During my first wave of applications, I played along and asked/prodded/poked my references - all of them busy fellows - and got them to send out letters of recommendation. Out of ~15 applications, I had one interview (didn't get it), and the rest... dead silence. Ok, so why did I hassle my references if I most likely didn't make it past the first round? On my 2nd, current, wave of applications, I'm not going to send out references along with my other documents. They can read my stuff, and If they are interested and want to advance me to a second look, they can contact me (or my references directly - they are on my CV) and I would be more than happy to get letters sent out. Am I putting myself at a disadvantage here? Is this unreasonable? If it is unreasonable on my part, then how do I deal with this without trying the patience of the kind folks who are good enough to be in my corner. And who is responsible for this nonsense - HR? On an unrelated topic - as I mentioned, I'm a [North American] doing a postdoc in [Western Europe]. I'm applying for positions in North America. Do you think that my geographical location places me at a disadvantage - all other things being equal? As for your location in Western Europe, I suspect that it does not particularly matter; it might make interviews a little bit difficult or expensive. As long as you've been publishing in well-recognized journals and the like, you're probably okay. But the closest I'm ever going to come to the faculty club is cutting the lawn in front of it. Readers, you're a lot more knowledgeable than me. Your thoughts, please. Good morning! Between August 23 and August 27, there were 93 new positions. Of these, 35 (38%) were academically connected and 49 (53%) were from Kelly Scientific Resources. Two research and development positions available with an early-stage company in Bozeman, Montana, a town of 35,000 in an area of amazing beauty. Positions would focus on (a) biosensor linker design and synthesis and (b) synthesis of porphyrin therapeutics for PDT cancer treatment. Anticipated start date for (b) October 2012 for a 2 year period with 6 month reviews. Salary for (b) is pre-set by funding. Sounds interesting; Bozeman is a lovely town. Iselin, NJ: BASF is hiring an experienced B.S./M.S./Ph.D. analytical chemist; expertise with optical spectroscopy techniques desired. San Carlos, CA: Novartis is looking for an experienced M.S./Ph.D. analytical chemist to perform method development and stability-related work towards inhalation-based drug delivery. Who does Lilly want? : Eli Lilly and Company has 6 positions for the search term "chemist", including a "director of bioproduct analytical development" position. Faculty search going strong: Boy, there are a lot of positions. Nashville, TN: Vanderbilt University is searching for an assistant professor position in biochemistry: "We particularly encourage applications in the area of mechanistic biochemistry, including but not limited to single-molecule, chemical biology, and structural methodologies." West Lafayette, IN: Purdue University desires two assistant professors in synthetic medicinal chemistry. The pay ain't bad, especially for (relatively) rural Indiana. Boston, MA: Emmanuel College wishes to hire an assistant professor of inorganic chemistry; you may be teaching general and/or organic chemistry. Raleigh, NC: NCSU is hiring a director for its X-ray crystallography facility. Salt Lake City, UT: The University of Utah wishes to hire an assistant professor of physical or inorganic chemistry aimed at catalysis or materials. In their 2,500-word article “California Deal Tightens Lab Safety,” Jyllian Kemsley and Michael Torrice fail to give even passing mention to UCLA’s substantial efforts to improve lab safety—which have become a model for other institutions—since the tragic December 2008 accident and long before the Los Angeles County district attorney ever filed charges (C&EN, Aug. 13, page 34). This leaves your readers with the wholly false impression that if not for the DA’s actions, the University of California, Los Angeles, never would have done anything to improve lab safety. Furthermore, in an article with 27 hyperlinks, not one links to UCLA’s widely circulated statement on the matter. In the end, UCLA is afforded nothing more than a single throwaway line in the last paragraph. The same goes for a July 27 C&EN Online Latest News post, “University of California Reaches Agreement in Connection with Charges in Lab Researcher’s Death.” That’s especially disappointing since UCLA has worked hard to give Kemsley open access to our actions and accomplishments over the course of her extensive reporting on this issue. She knows full well how hard we’ve worked, but she chooses to completely ignore it. As a former journalist, I’m not naive enough to expect advocacy for our side from any news organization, but I do expect fairness. "In response to the events that caused the death of Ms. Sheharbano Sangji, the Regents have implemented a comprehensive training and safety compliance program at UCLA. Among these corrective and remedial measures taken, UCLA’s Office of Environmental Health and Safety (“EH&S”) has produced a safety video setting forth the safe and compliant workplace practices in the handling and transfer of pyrophorics, including tert-Butyllithium. Standard Operating Procedures have been established and implemented for researchers working with hazardous chemical agents; personal protective equipment including fire resistant lab coats is mandatory for researchers working with pyrophorics. The Regents have made a substantial, comprehensive, and good faith effort to bring their laboratory safety practices and procedures into compliance with Title 8 and the California Code of Regulations for employee safety. (emphasis mine)"
CJ here: Let me be the first to congratulate you all for following the law more closely now! Let me also congratulate you for not robbing any banks this weekend! I'm also less than impressed with your open access for Ms. Kemsley; after all, you guys are a state institution and you're covered under the California Public Records Act. Once again, you're congratulating yourselves for following the law. Good job. "Acceptance of Responsibility for the Statement of Facts. For purposes of this agreement only, the Regents acknowledge and accept responsibility for the conditions under which the laboratory was operated on December 29, 2008 as set forth above. Mr. Ritea, until UCLA acknowledges their responsibility for the conditions that led to Ms. Sangji's death somewhere other than a legal agreement with people with coercive power, I'm going to put a low value on your press releases. They're just an exercise in self-congratulation, and not much more than that. Certainly, at times, a Salt. Shall I part my chains behind? Shall I put them in my reach? I shall wear my charges proudly, and walk upon the beach. 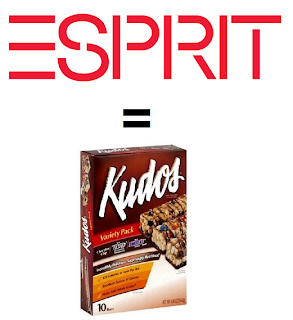 I have seen the products bonding, each to each. I do not think that they will bond to me. Patrick M. Donovan says he “stumbled into the diagnostics field” after losing his job at now-defunct Epix Pharmaceuticals in Lexington, Mass., in 2008. In the midst of a job search, he noticed an online posting for a senior biochemist position in Walpole, Mass., at Siemens Healthcare Diagnostics, an industry giant. Despite the fact that he is not a biochemist, but rather has a Ph.D. in organic chemistry from Boston College, Donovan applied for the position because his skills closely matched the job description. The company was actually looking for a synthetic chemist to make chemiluminescent labels to enhance its diagnostic detection technology, but it used the biochemist title to cover positions in many research areas including chemistry and microbiology. He was hired for the position at the end of 2008. Donovan says he’s not sure what gave him the edge in landing the job, but notes that the compounds he now works with are similar to the kinds of molecules he focused on in graduate school. Another plus, he says, may have been his postdoc experience at contract research organization Organix, as well as his work as an analytical quality control chemist for Armstrong Pharmaceuticals before graduate school. Why does it seem like Dr. Donovan is moving in the right direction, working for a medical diagnostics company, as opposed to a smaller pharma company? Is medical diagnostics "up the value chain" from pharma? (I don't really think so, but it seems that way sometimes.) Perhaps it is that medical diagnostics does not seem to be as astronomically difficult as pharma -- now I'm really talking ex recto. Readers? In particular, Ariad looks for outstanding medicinal chemists who can also contribute to its overall drug discovery efforts in other ways. Often that means that they have some background in structure-based drug design or protein biochemistry or experience in other areas such as absorption, distribution, metabolism, and excretion (ADME) studies, Shakespeare says. It's great to get numbers on what small companies are looking for. In this case, it is quite clear that Ariad is looking for fairly experienced medicinal chemists and certainly not new graduates. More on both of these articles later, but I wanted to bring them to your attention. Grim data on the economies of China and Europe on Thursday gave a warning signal for global growth, and suggested governments and central banks around the world may be forced to pump in more stimulus to kick-start activity. An index of manufacturing in China, the world's second-largest economy, showed the biggest drop in activity in nine months. Factories were hit by a steepening fall in demand for exports, in part a reflection of the euro-zone debt crisis that has clamped down hard on demand for Chinese goods in the European economies. Data on Thursday suggested the euro zone is falling into recession. ...China's manufacturing sector was hit in August by a steep drop in export orders, the PMI showed—a reflection in part of slowing demand in Europe. Markit said Thursday that euro-zone business activity continued to shrink markedly in August, pulled down by the weakest performance in more than three years in European powerhouse Germany. The figures point to the euro zone falling into its second recession in three years, a development that could heighten tensions in the 17-nation currency zone as its leaders fight to contain the sovereign-debt crisis while economic output withers and unemployment rises. If you've been to pick up an inexpensive Haier air conditioner, I suspect now is the time. I wonder if we'll start seeing Chinese commodity chemical prices start falling like a rock. Well, whaddya know? "A cost to the individual and society"
Let me start with the obvious question: Is American science in decline? [snip] Some analysts see the problem differently. They talk about a surfeit of scientists? I will continue to argue (perhaps too stridently and perhaps ignoring other data) that ignoring of opportunity cost is something that young scientists-in-training do at their peril, especially in a relatively low job growth economy. Good morning! Between August 21 and August 22, there were 21 new positions posted on the ACS Careers website. Of these, 5 (24%) were academically connected and 8 (38%) were from Kelly Scientific Resources. Iselin, New Jersey: BASF is looking for an entry-level analytical chemist to do NMR spectroscopy on materials (looks like) and also a B.S./M.S./Ph.D. analytical chemist to support its battery research efforts. "Southern California": Shimadzu is looking for 2 field technicians with 3+ years experience in fixing instruments. San Diego, CA: Takeda San Diego has two openings for staff scientist-level medicinal chemists. Can't tell if this is a Ph.D.-level position or not. A broader look: Monster, Careerbuilder Indeed and USAjobs.gov show (respectively) 247, 782, 2,738 and 21 positions for the search term "chemist." They should keep their eyes open for Justin Bieber or Dakota Fanning at freshman orientation. The Biblical sources of terms such as “Forbidden Fruit,” “The writing on the wall,” “Good Samaritan,” and “The Promised Land” are unknown to most of them. If they miss The Daily Show, they can always get their news on YouTube. Having grown up with MP3s and iPods, they never listen to music on the car radio and really have no use for radio at all. Since they've been born, the United States has measured progress by a 2 percent jump in unemployment and a 16 cent rise in the price of a first class postage stamp. They have always been able to see Starz on Direct TV. Ice skating competitions have always been jumping matches. Despite being preferred urban gathering places, two-thirds of the independent bookstores in the United States have closed for good during their lifetimes. Astronauts have always spent well over a year in a single space flight. Lou Gehrig's record for most consecutive baseball games played has never stood in their lifetimes. There are a lot more at the link; enjoy. Good morning! Between August 17 and August 20, there were 86 new positions posted on the ACS Careers website. Of these, 19 (22%) were academically connected and 53 (62%) were from Kelly Scientific Resources. Pittsburgh, PA: Valspar is a global coatings company; they're looking for a LC/MS expert. 5+ years experience desired, but not necessary. Other analytical expertise (AFM, SEM, GC/MS, pyrolysis GC/MS, DSC, FTIR, rheometry, GPC, and TGA) appreciated. Foster City, CA: Gilead is looking for a Ph.D. analytical chemist; looks to be involved in process development. 3+ years industry experience desired. The candidate should have at least a Masters degree in Organic/Organometallic chemistry with a minimum of 4-6 years of laboratory (bench and kilo lab) experience in synthesis, charcterization, and use of organolithiums and other alkali, grignards, boronic acids/esters, organophosphorus compounds, as well as such methodologies as cross-coupling, Friedal-Crafts, Wwittig, Mitsunobu, and standard oxidations and reductions. Douglas, Georgia is a town of 12,000 people. Why remain confidential when a Google search will reveal who you are, almost immediately (5th or 6th hit)? New York, New York: Columbia University is looking for an associate research scientist with a Ph.D. in chemical physics. The Center is seeking an experimental Chemical Physicist to conduct basic research within the EFRC to undertake characterization of surfaces, interfaces, and bulk materials using state of the art characterization equipment at external national laboratory facilities and to work with EFRC faculty members to understand and interpret the results. Sounds interesting -- is it really in New York, though? Hempstead, NY: Hofstra University is looking for a part-time stockroom manager. Was a nationally-oriented search really needed for this position? Fall faculty search: Centre College (Danville, KY) is looking for an assistant professor of inorganic chemistry for August 2013. Two or more tenure-track positions are available at the University of Washington in Seattle. Brandeis University (Waltham, MA) is also looking for an assistant professor of inorganic chemistry for fall 2013. Philadelphia, PA: Thomas Jefferson University is searching for a post-doctoral fellow for a program in cancer/diabetes medicinal chemistry. 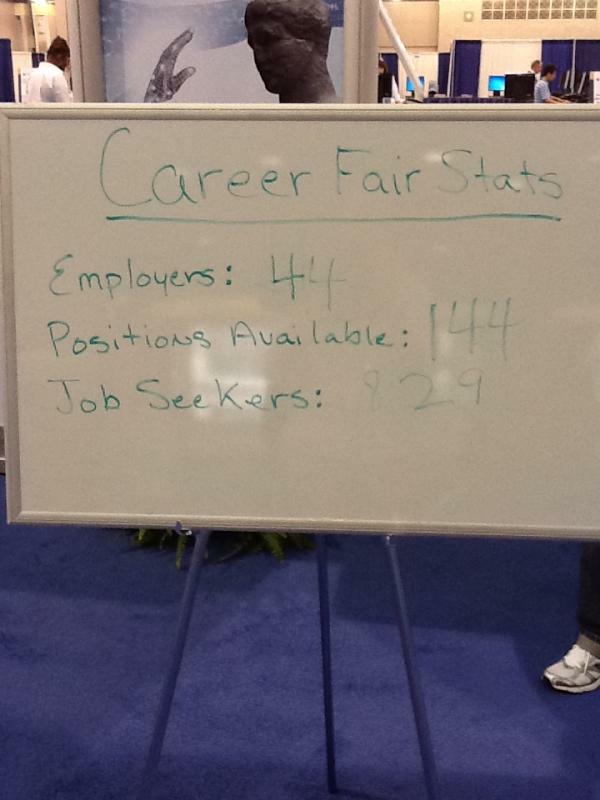 That's a ratio of job seekers to positions of 5.75 to 1, which is a lot better than the 8.76:1 ratio at ACS San Diego. More positions than San Diego, as well. Fewer positions than last year's fall conference in Denver, unfortunately. 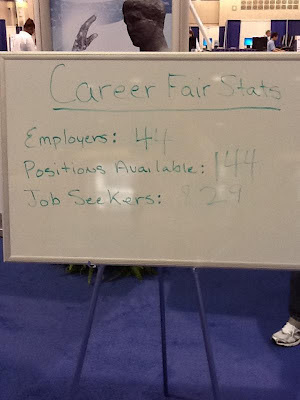 The official numbers off the ACS Careers database shows 121 positions for the Career Fair and 40 positions for the Virtual Career Fair. Aigh. 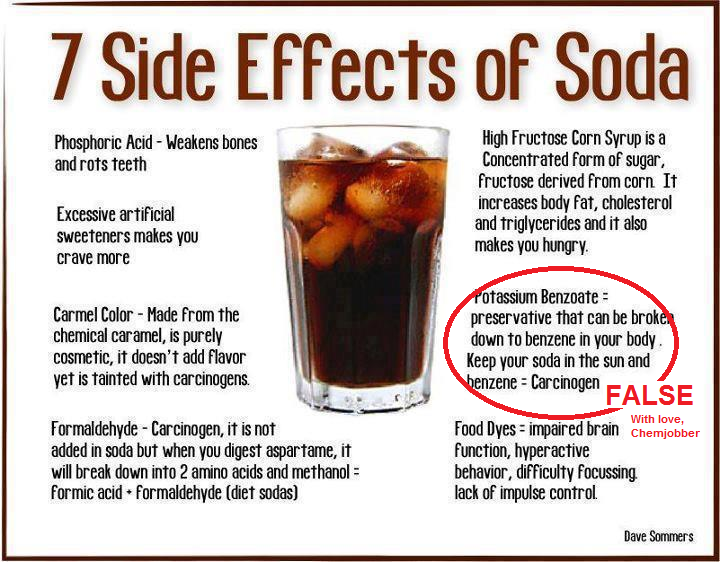 For those of you who have had some basic medchem (as I have had, and no more), I thought you would enjoy this little tidbit. It's kinda funny when people get things exactly backwards. Go walk by WHYY and see if Terri Gross is in. South Street was interesting; I didn't go into the purveyor of prophylactics, though. Try some scrapple at the diner at the Reading Terminal Market. Are the Phillies in town? Why, yes. I would not recommend walking across the bridge to Camden, New Jersey, which I did in my quest to visit all 50 states. (41 down, 9 to go!) I took the train/subway back, which was also interesting. Commuter trains aren't something I deal with on a regular basis. Readers, any suggestions -- I'm sure I've missed something? Good places to eat, etc.? What's your ACS meeting routine? 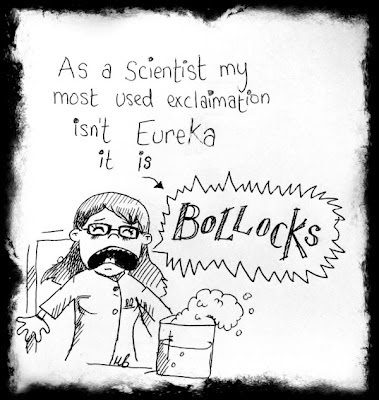 On a day like today, when a key experiment went awry on step 1.5 of 4 while I wasn't watching it in the middle of the night, this cartoon by @TwistedlilKitty is so, so true. What is the cost of actual API in developing drugs? I should add, for biologics trials, cost of goods can be material part of the cost. API for antibodies cost about $300/g or more, and typically, you would dose about 1 mg/kg once or week (roughly). That's 100 mg per week, or 5 g per year per patient. Once you add in the fill/finish, labeling and QA costs, it's about $500/g X 5 g = couple of thousand dollars per patient. API cost can be an issue. The last campaign I ran cost ~$2M. For two batches. That doesn't cover all of Phase II - only part. Plus all the upfront cost of working out the synthesis strategy, impurity profile, polymorph stuff, GMP stuff...etc. This is not as expensive as clinical, but its not insignificant. The comments on that particular post have really taught me about all the moving parts of a clinical trial. Basically, it seems like you're hiring doctors, patients, hospitals and people to watch over the process. That sounds expensive. Outcomes from the process were never predictable. Employees in certain divisions were given what were known as M.B.O.’s—management business objectives—which were essentially the expectations for what they would accomplish in a particular year. But even achieving every M.B.O. was no guarantee of receiving a high ranking, since some other employee could exceed the assigned performance. As a result, Microsoft employees not only tried to do a good job but also worked hard to make sure their colleagues did not. I am no expert when it comes to employee reviews. It makes sense to me that employees need to be evaluated, both as a team and as individuals. (I've always suggested to my friends that perhaps the Pro Football Hall of Fame should not allow entry by individuals, but by unit, e.g. quarterback + offensive line + wide receivers, etc.) How to do it well and fairly, of course, is the real problem. But stack ranking or its other monikers cannot possibly be a good way to get intelligent people to work together well. It is probably an excellent way of distributing gains unevenly, though. Thanks, business world. Readers, I understand that stack ranking has been used in the pharmaceutical research world -- how's it worked out for you all? I understand that there are employers that have yet to post their positions, but I thought it might be interesting to see where next week's ACS Career Fair is stacking up. Fall 2010, Boston, (8/23/10, Monday of meeting): 206 positions posted. Fall 2011, Denver, (8/25/11, Thursday before meeting): 189 positions posted. Spring 2012, San Diego, (3/22/12, Thursday before meeting): 49 positions posted. Fall 2012, Philadelphia (today, Thursday before meeting): 116 positions posted. So, we're not doing too badly. Hopefully lots more to come. Best of luck to all! Good morning! Between August 15 and August 16, there were 58 new positions posted on the ACS Careers website. Of these, 12 (21%) were academically connected and 9 (16%) are from Kelly Scientific Resources. ACS Career Fair watch: 116 positions posted for the ACS Philadelphia Career Fair, 40 posted for the Virtual Career Fair. Greenville, SC: IRIX is looking for an analytical chemist with experience in a GMP environment; HPLC, GC desired. Cambridge, MA: Vertex is also looking for a chromatographer, one that has experience with small molecule purification. M.S./Ph.D. desired, with 5+ years experience in the pharmaceutical industry. Wayne, NJ PA: Johnson-Matthey has posted 11 positions, mostly process-oriented. Looks pretty interesting, and really, everyone loves a catalyst. Josh Bloom on the (lack of a?) future of pharmaceutical innovation. Just in case you didn't know what pharmaceutical research entailed, Derek will try to educate you. David Perrey on the perils of the common fig. James talks with America's Top TA. The Chemistry of the Dark Knight, by Doctor Galactic. A placemarker for See Arr Oh's discussion of working on the weekend. Dr. Freddy talking about Goldfinger and chemistry. Curious Wavefunction reminds us that drug design is NOT airplane design. I found this Miss MSE post on a recent conversation kinda poignant, mostly regards to her friend. Are you a PhD-qualified chemist eager to become an outstanding scientific leader? An inquisitive mind who would thrive on a diverse, intellectually demanding global leadership programme? Do you want to translate your scientific expertise into disease-beating medicines? And help people across the world to do more, feel better and live longer? We are a science-led, global healthcare company that puts patients first. Our business is focused on developing medicines that improve the quality of human life. To meet the future strategic challenges this entails, we need to fast-track the finest scientific talent into senior leadership roles within our business. 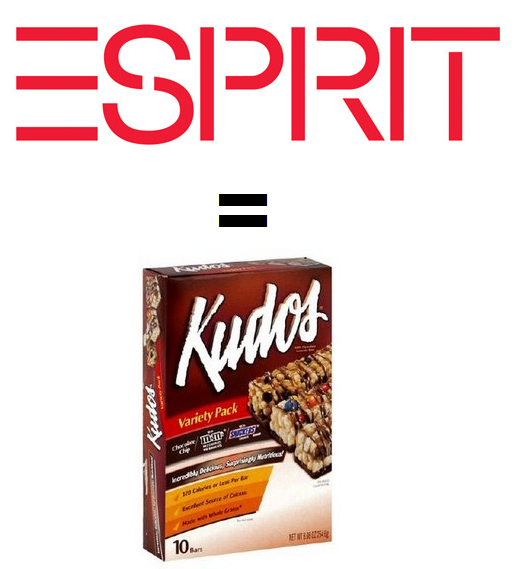 Esprit R&D is a three-year, accelerated, multi-disciplinary and individually tailored programme. It is heavily backed by our senior management team, and it will give you incredible kudos as a chemist among your peers. Over the three years, you’ll undertake high-profile, global rotations that will give you in-depth chemistry knowledge and expertise. You’ll apply this knowledge across a range of drug development disciplines from discovery research to commercialisation and business development. And as well as learning from thought leaders in your field, you’ll benefit from unrivalled formal training, mentoring, coaching and development to enhance your leadership capabilities. To ease their work, small charges of dynamite were used to loosen the mixture. 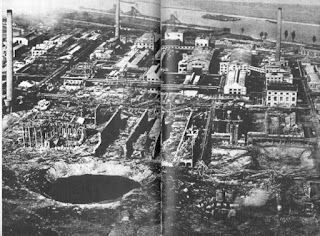 The procedure was tried experimentally and was considered safe; it was not known at the time that ammonium nitrate was explosive. 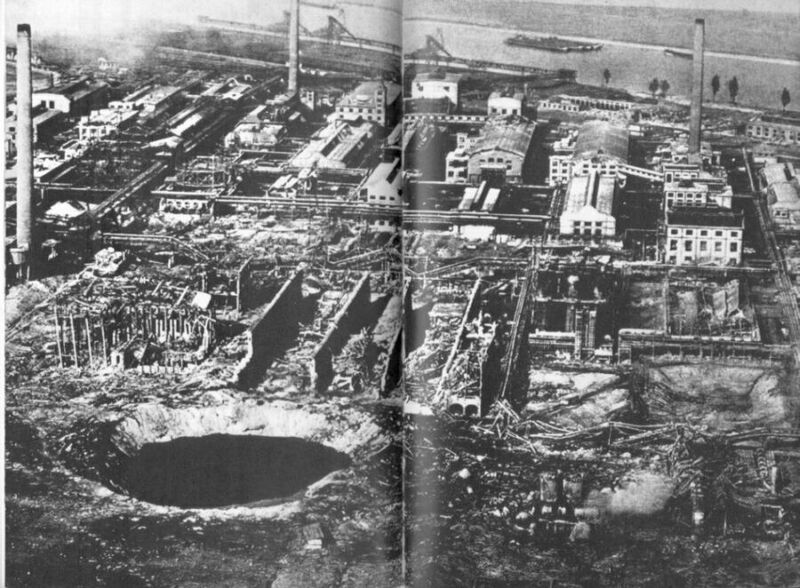 Nothing extraordinary happened during an estimated 20,000 firings, until the fateful explosion on September 21. As all involved died in the explosion, the causes are not clear. A theory is that the mixture changed and a higher concentration of ammonium nitrate was present. ...in substantiation of its innocuous character they adduce the fact that in factories producing it no accident has occurred for a number of years, when explosives have been applied to it for the purpose of breaking up blocks of the mixed salts which have set hard. I'm fairly new to this field, but it seems to me that part of process chemistry is showing "the box" in which a process can be run. A process chemist can only hope to guarantee desired results (yield, purity/quality, safety) in within the reaction parameters (heat, concentration, volume, what have you) that have already been defined. One wonders what happened at Oppau; obviously, someone stepped outside the box. Susan Ainsworth of C&EN wishes to hear from chemists who are current or former industrial postdocs. She'd like to hear about how long it took people to find their positions, what gave them an edge, and what advice they could offer to others seeking industrial postdocs. Please e-mail her at s_ainsworth -at- acs(dot)org by Thursday morning of this week (August 16.) Thanks! The school has just published the sobering results of the surveys over the last 13 years. While there appears to have been a slight drop in the numbers of students who report experiencing mistreatment, more than half of all medical students still said that they had been intimidated or physically or verbally harassed. Note, especially to relatively junior people: It is possible that you may encounter this sort of behavior. It is wrong! It is not your fault. Unfortunately, it may not even have anything to do with you, as a person, as opposed to your status in whatever hierarchy that you're in. An organization that puts up with that kind of behavior, especially the more severe kind, is not an organization that you want to be a part of. It's my sincere hope that, as time goes on, that this sort of behavior (verbal abuse, physical intimidation, sexual harassment, racial comments) happens less and less in workplaces. I don't believe that verbal abuse produces better physicians and it certainly doesn't produce better chemists. Good morning! Between August 8 and August 9, there were 132 new positions posted on the ACS Careers website. Of these 22 (17%) were academically connected and 54 (41%) were from Kelly Scientific Resources. Hanover, PA: AquaPhoenix Scientific is looking for a B.S. chemist to be a production chemist; 5+ years experience desired, must be able to lift 50 pounds. Shanghai, China: QR Pharmaceuticals is hiring, well, everyone. 9 open positions, from medicinal chemistry to quality assurance. Parkersburg, WV: DuPont is looking for a Ph.D. analytical chemist to work on fluoromonomer and fluoropolymer measurement. 1-5 years manufacturing lab experience desired. Wilmington, DE: DuPont is also searching for a Ph.D. synthetic organic chemist for a coatings project; it appears to be an entry-level position. Including both of the above, DuPont has 6 open positions, including the mellifluously-named "On-Line Process Analyzer Consultant" position. Neenah, WI: Kimberly-Clark is searching for a M.S./Ph.D. chemist with experience in colloid science. Looking, looking, looking: Vertex is advertising for 27 positions, Tate and Lyle, 6 positions. I'm so immature: Applechem ("Northern New Jersey") is searching for a product development chemist: "Product Development Chemists will be responsible for developing new ingredients and their applications for the cosmetic and toiletry industry, via organic chemistry synthesis, or through compounding and blending chemicals." The toiletry industry? Snerk. It's fall recruiting season! : Lots of positions, and more coming. Auburn, AL: Auburn University is searching for an assistant professor of organic or organometallic chemistry for fall of 2013. Rockville, MD: Montgomery College is a two-year college; they're looking for full-time faculty for general chemistry; M.S./Ph.D. desired. The City So Nice: New York University is hiring for a faculty position in its Biomedical Chemistry Institute; applications for junior and senior positions accepted. Columbia University is searching for a junior or senior faculty position, no specialty specified. Santa Barbara, CA: UC-Santa Barbara is hiring for a lecturer position, starting at 64.9k. Gee, that pretty much sounds ideal, doesn't it? Spokane, WA: Whitworth University is hiring an assistant professor of analytical chemistry to start Fall 2013. Psst: What's a "high through-put HPLC system with autosampler"? Incoming faculty can expect western style and traditional cultural living experience similar to any midsize North American or European cosmopolitan city including a rich and vibrant atmosphere which includes excellent clubs and restaurants, theater, music , opera, dancing, art museums, modern or traditional bazaar shopping, professional and amateur sports, recreation, and much more. As a retired chemist who is fortunately no longer subject to the vagaries of the employment market, I was still appalled by both the high unemployment figures for chemists and the low starting salaries (C&EN, June 4, page 36). Chemistry graduates face one of the most daunting curricula at a college or university, one that requires intellectual and practical skills. They now encounter a high unemployment rate, as well as a low starting salary. While “only” 17% are unemployed and 14% actively looking for employment, these figures are warped by the high percentage of those who, whether by choice or necessity, have chosen to go to graduate school, leaving only 23% permanently employed. 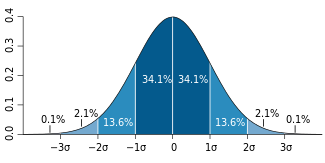 At the Ph.D. level, the numbers are not much more encouraging. The irony is that there is a demand from Congress and the executive branch to graduate a larger number of technically trained students. The question to ask is, for what purpose? Is it to increase the already excess numbers of such students? Are we becoming a nation of overeducated and underemployed people? I hope not, but signs indicate that this is what is occurring. Best wishes to Mr. (Dr.?) Marans, who seems to be enjoying his retirement writing letters to the editor. The Nov. 24, 2003, issue included C&EN’s annual “Employment Outlook” feature. The first story in the package of stories was titled “Slump Continues for Chemists: Unemployment is at a record high, but opportunities exist for the well prepared.” Sound familiar? These are difficult times for the U.S. economy, and chemical scientists have not been spared the fallout. 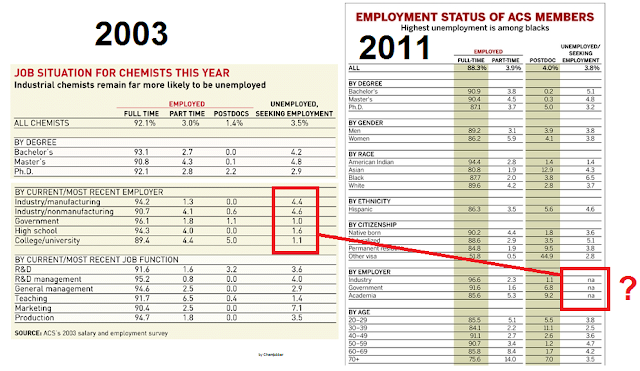 Unemployment for chemists--as measured by unemployment of American Chemical Society members--is at a record high. C&EN Editor-at-Large Michael Heylin reports that the jobless rate of 3.5% that the most recent ACS Salary Survey reveals as of March 1 this year is up from 3.3% a year earlier. It also exceeds the earlier all-time high of 3.2% set in 1972, the first year of this annual survey. Industrial chemists have been hit particularly hard. For those in manufacturing, unemployment is at 4.9%. For those with nonmanufacturing firms, it is 4.8%. However, among academic chemists, unemployment remains negligible at 1.1%, and government-employed chemists are essentially fully employed with an unemployment level of 1.0%. I wonder why those breakdowns aren't released anymore. I need to check this out. U.S. chemical firms are running out of dependable strategies for maintaining earnings in a global economy that shows few signs of growth. In the second quarter, the 23 firms tracked by C&EN reported an average decline in earnings of 6.1% compared with the year-ago quarter. And in the first quarter, earnings fell by 8.4%. Also in the second quarter—and for the first time since the Great Recession ended in 2009—more than half of the surveyed companies reported a decrease in top-line revenues. On average, the companies saw sales retreat by 1.1%. Chemical executives blame the drop on lower sales volumes because of customer destocking, depressed prices, and currency exchange losses due to a relatively strong dollar. Second-quarter sales plummeted at many big pharmaceutical companies as the full impact of patent expirations on top-selling products kicked in. Companies hit the hardest by generics competition are trying everything from acquisitions to geographic diversification to shore up their businesses. For a second consecutive quarter, overall sales and earnings for the big pharma­ceutical companies tracked by C&EN declined. For the 10 companies reporting second-quarter results, sales were down 4.5% compared with the same period in 2011. Earnings fell 2.6%. Well, let's hope this is a temporary thing. I was working on a long-ish post on my point of view on the #SheriSangji case, but Jyllian Kemsley has really outdone herself with a point-by-point analysis of the chemical safety-related portion (4 pages, really) of Professor Harran's defense motion. the arrest warrant should be invalidated and Professor Harran should be released. I can't really do it justice, so you should definitely go over there and just read the whole thing. [Kemsley] The motion references discussion between Baudendistel and Sangji’s undergraduate research adviser, Pomona College chemistry professor Daniel O’Leary, about Sangji’s two papers published in Organic Letters and the Journal of the American Chemical Society. Safety Zone readers, what say you? Do you think it is necessary for a Cal/OSHA investigator to understand that type of literature to understand the incident that injured Sangji? B: Well, you know, you guys are a lot smarter than most of us. B: Trust me, I've read some of the literature. I don't understand it. O: Let me see here. So you want the 2005 one? The 2005 one is "Direct Assignment of the Relative Configuration in Acyclic 1,3-diols." Heaven forfend that a senior Cal/OSHA investigator does not understand NMR structure elucidation papers! First of all, I think it's rather ridiculous that the Harran defense team uses this particular statement of humility (a characteristic that endears Mr. Baudendistel to myself, I confess) to indict his expertise. I would find it more convincing if the defense team noted that Mr. Baudendistel did not have a degree in chemistry or significant time at the bench (e.g. more than 5 years) or that he did not possess certification as a Chemical Hygiene Officer. I am rather more confident that he's willing to openly admit when he's out of his zone of expertise, i.e. proper procedures when handling pyrophorics. I also note that he's consulting experts; it speaks well to the Baudendistel report that one of the people that he consulted was Mark Potyen, an Aldrich R&D chemist with 19 years experience at the bench and someone who uses tBuLi on a regular basis. B: Do you know if there was any direct policy by UCLA that lab coats were worn while personnel are in the lab? W [the safety officer]: No. B: At that time, anyway. W: No. Other than what it says in the lab safety manual, how it suggests wearing a lab coat in the lab. B: So is it accurate to say that there was no, there was no rule that a lab coat be worn in side the lab? W: Yeah, I don’t there there’s any rule, like major policy by the university. Baudendistal: Was it your understanding that it was a discretionary matter? B: And discretionary between who? W: Discretionary between whoever’s working in the lab. 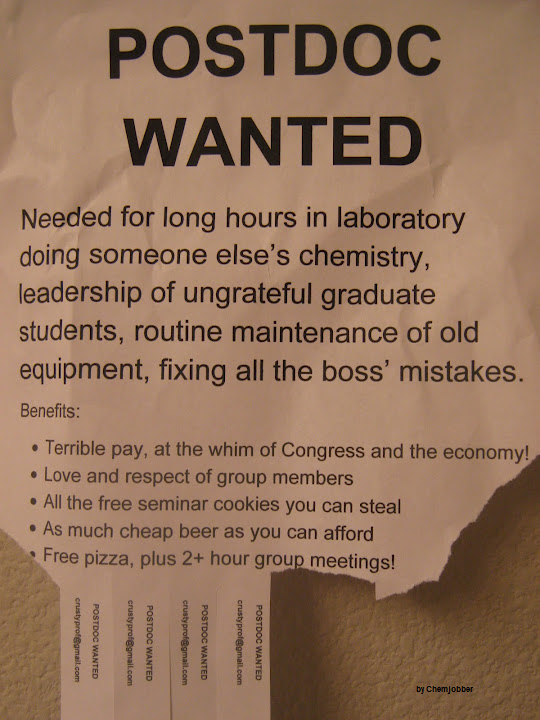 It could be the PI, who makes it discretionary for the whole lab group, or the workers themselves. B: But it was not, there was no rule that lab coats were required to be worn while in the lab. I think it's a pretty remarkable indictment of UCLA lab safety policy pre-Sangji that the relevant chemical safety officer would be forced to admit this, especially in front of UCLA lawyers. I'm surprised one of the lawyers didn't fake a heart attack right there to stop the questioning. 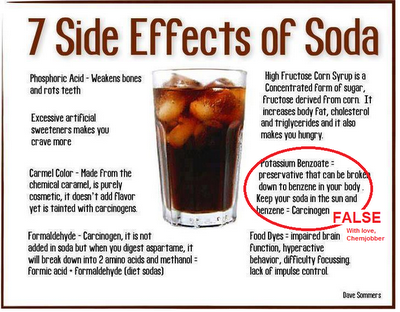 Brian Baudendistel is not a chemical safety expert. There were lab coats available to Sheri Sangji, and it's not Patrick Harran's fault that she didn't wear them. There are disputes between scientists as to what is the best means of transferring alkyllithium reagents at varying scales, whether glass or plastic syringe, or cannulation. You can't indict chemists for using "oral transfer of knowledge" when they all do it. She got some training in lab safety, when the report says she might have gotten none. I think that's pretty weak sauce, and not enough to put a hole in the Baudendistel report. Not that they're going to ask me, of course. Good morning! Between August 7 and August 8, there were 16 new positions posted on the ACS Careers website. Of these, 3 (19%) are academically connected. New Castle, DE: Croda is looking for a B.S. synthetic organic chemist for a position performing organic/polymer chemistry. 3-7 years experience preferred. Rockville, MD: The United States Pharmacopeia is hiring a bunch of chemists, mostly analytical, mostly experienced. Does General Electric want chemists? : Well, sort of. For the search term "chemist", there are two positions available for experienced Ph.D. analytical chemists/material scientists, both in Niskayuna, NY. ACS Career Fair watch: 20 positions available for the Virtual Career Fair, 58 positions open for the Philadelphia Career Fair later this month. A broader look: Monster, Careerbuilder and Indeed show (respectively) 247, 731 and 2,984 positions for the search term "chemist." Labels: acs career fairs, broader look, daily pump trap, open positions at? Jyllian Kemsley and Michael Torrice have published a quite comprehensive look in Chemical and Engineering News at the results of the agreement between the Los Angeles County District Attorney's Office and the UC regents. In addition to an overview of the settlement (in return for dropped charges against the UC reagents), Drs. Kemsley and Torrice talk to a number of legal experts regarding what I've termed "the Baudendistel gambit", i.e. that Professor Harran's legal team have discovered that Cal/OSHA senior investigator Brian Baudendistel was involved in a murder case as a teenager, and (according to the defense) was convicted of first-degree murder. On July 27, in exchange for the district attorney dropping the charges, the UC regents accepted responsibility for the conditions under which Harran’s laboratory was operated at the time of the incident. They also agreed to establish an environmental law scholarship in Sangji’s name at UC Berkeley. The scholarship will have a $500,000 endowment, to be funded within one year. UC also agreed to comply with the terms of a specified lab safety program for the chemistry and/or biochemistry departments at all campuses. In large part, the program requires the university system to follow the labor code laws it was cited with breaking: For example, the campuses must maintain laboratory safety manuals and chemical hygiene plans, “in full compliance” with California labor code. Other components of the program state that UC campuses must require principal investigators (PIs) and all other laboratory personnel to complete training on laboratory safety and their safety responsibilities, prohibit new PIs from operating their labs until after completing lab safety training, ensure that standard operating procedures (SOPs) are written and reviewed for a specified list of chemicals, and report occupational injury or illness immediately to Cal/OSHA. The training components must begin within 60 days of July 27. UCLA is further obligated to conduct safety inspections and require PIs to assess whether personal protective equipment (PPE) is adequate for the procedures done in their laboratories. The agreement outlines a minimum laboratory PPE standard, starting with full-length pants and closed-toed shoes to be worn at all times. It also dictates that anyone found working in a laboratory without required PPE must be removed from the lab and the incident documented. UC does not have an estimate for the cost of implementing this program across its 10 campuses. It did add a new position for a laboratory safety manager to be part of the president’s office. That person “will assist campuses in implementing system-wide laboratory safety initiatives developed during the past two years and serve as project manager to ensure timely completion of those initiatives and processes specified in the settlement agreement,” Young says. How the agreement will be implemented on campuses remains to be seen. UC Davis’ Chemical & Lab Safety Committee “has been evaluating our practices extensively over the past year and has developed recommendations for a more robust, strengthened lab safety program,” says spokeswoman Claudia Morain, adding that the recommendations align with the terms of the agreement. The committee’s proposal is currently being reviewed by the provost. Representatives of several other UC campuses did not respond to interview requests or declined to comment. I am terribly skeptical of most top-down programs; this one is no different. Pacheco and other experts in juvenile law say that, if Cal/OSHA investigator Baudendistel is the one who was involved in the 1985 murder, then he probably didn’t have to report the crime on his applications. The person connected to the 1985 murder was a minor at the time of the crime, and a 1990 U.S. Court of Appeals decision describes him as a ward of the California Youth Authority, the state’s juvenile prison system. That means he was tried through the juvenile court system, not the criminal one. According to California law, a sealed juvenile record essentially means the case never happened, Pacheco says. Therefore, the person convicted of the murder could have truthfully answered “no” on any application asking if he had prior criminal convictions. “Because according to the law, there hasn’t been one,” she says. Even if the convicted person hadn’t sealed his juvenile records, they still would remain confidential, and it’s unlikely he would have been compelled to disclose his past on a Cal/OSHA job application, says Stephanie Sauter, the founder of the Law Project of Los Angeles, which provides legal assistance for people with past criminal convictions. But, if investigator Baudendistel is the person who was convicted, he could have hurt his credibility in his responses to the district attorney’s questions about the 1985 crime, Pacheco says. The only way to know for sure, she says, is to look at the specific questions the district attorney asked and the details of the 1985 case. For example, if the attorneys asked him if he had been a ward of the California Youth Authority, to be fully honest, he’d have to respond, “yes.” But if the attorneys asked if he had killed a man in 1985, he could have said, “no” and still been forthright, because he was not the man who fired the shots, according to newspaper accounts of the crime. Sauter sees the issue of Baudendistel’s communication with the district attorney as a gray area. But if Baudendistel had committed the murder and had sealed his juvenile records, she says, he could make the argument that under the law the case never happened, relieving him of the obligation to reveal his involvement in the crime. Considering all the possible situations involving what Baudendistel wrote on his applications or said to the district attorney’s office, Sauter thinks it’s unlikely his credibility is open for attack. The defense motion also claims that a murder conviction can be used to discredit investigator Baudendistel’s report and any future testimony. But, Pacheco thinks that murder is less relevant for this case than a conviction of fraud or perjury would be. Sauter goes further, suggesting that if the case went to trial, a judge probably wouldn’t allow the defense to tell a jury about the alleged murder, because it isn’t relevant to the case and could unfairly prejudice the jury. The legal issues raised by the defense motion could get resolved on Sept. 5, when Harran will appear again in court for arraignment. I am not a lawyer, so I can't really comment intelligently on any of it. More thoughts later (tomorrow or Friday), but I wanted people to know that this excellent summary and analysis is out there.